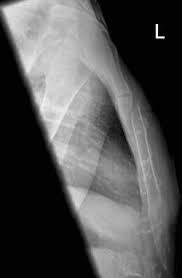 Sternal fractures are a rare sequela of blunt thoracic trauma (Recinos et al.) and most often occur due to motor vehicle collisions. They are also often associated with other chest injuries such as rib fractures and contusions. This week on the Skeptics Guide to Emergency Medicine – Hot off the Press, we had the chance to critically appraise a prospective study on delayed complications of sternal fractures. We also had the privilege of interviewing Drs. Samuel Racine and Marcel Emond, two of the study authors. To hear the podcast and review our complete critical appraisal of the study, head over to TheSGEM. For some additional reading material on sternal fractures and the need for admission, here is a great post by Salim Rezaie at ALiEM. Now join the discussion over at the SGEM, or by tweeting us @socmobem or @thesgem. Racine S, Emond M, Audette-Cote J.S, et al. Delayed complications and functional outcome of isolated sternal fracture after emergency department discharge: a prospective, multicentre cohort study. CJEM 2016;18(5):349-357.